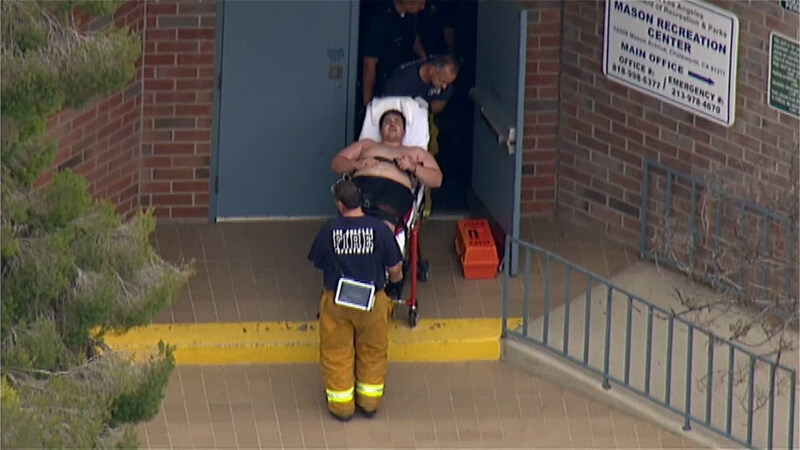 A suspect is wheeled out of a recreation center in Chatsworth on Friday, May 22, 2015. CHATSWORTH, LOS ANGELES -- A naked suspect was taken into custody at a Chatsworth recreation center Friday morning after reports that he was trying to kidnap an infant. Police responded to a report of a naked man who entered a gym in the 10400 block of Mason Avenue at 10:20 a.m. and tried to take a girl. The suspect, who was possibly under the influence, will be arrested for attempting to take an infant, LAPD said. The infant is not related to the suspect. LAPD had earlier reported that the infant was the suspect's sister. Witnesses told Eyewitness News that the suspect's clothes came off during a struggle to subdue him. The suspect's name has not been released. No further information was immediately available.